Mold and Prototype Archivi - The School of Ceramics "Romano Ranieri" Mold and Prototype Archivi - The School of Ceramics "Romano Ranieri"
The simplest molds consist of only one piece of plaster and can be used with either solid handbuilding clay or liquid clay slip to shape object such as tiles. 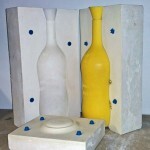 More complex molds, made of two or more pieces of plaster that fit together, are most often used with slip to produce hollow, slip cast objects such as vases. 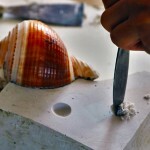 Our model can be an existing object or an object that we’ve made using clay or many other materials. The most important aspect of making molds is diagnosing the model: mold must release easily from the model. To make a good diagnosis, it’s necessary to understand the concept of undercuts, indented areas in the model that can make it impossible to separate the model from the hardened plaster mold. After the creation of a prototype we procede making professional mold by gipsy and than we make test with different kind of clays (porcelain, stoneware, white clay etc.) and firing tests.